For the past few months I’ve been experimenting with this terrarium and I think I have it finally figured out! I’m sharing it here because it’s a great little project to do as a family and we’re very happy with how it turned out. We tried making one of these a couple of years ago but used the wrong plants and had to start from scratch. We learned the hard way that for this project it was best to choose plants that can tolerate high humidity, like moss or other low-growing woodland plants. Next, we filled the bottom with a layer of stones and followed it up with a layer of the charcoal. This step was new to me but I read that it helps to have charcoal in a closed container terrarium because it acts as a natural filter. The we added the soil. Pro tip: Use a chopstick to arrange it and get creative by adding little hills and valleys in your mossy landscape. Spray the soil with water before moving on to the next step. Now it’s time to add the moss! Move it around to find the prettiest arrangement. Press it down lightly into the soil and spray with water. Once that’s done you can add your decorations, things like pretty pebbles or figurines personalize your project and really make it your own. 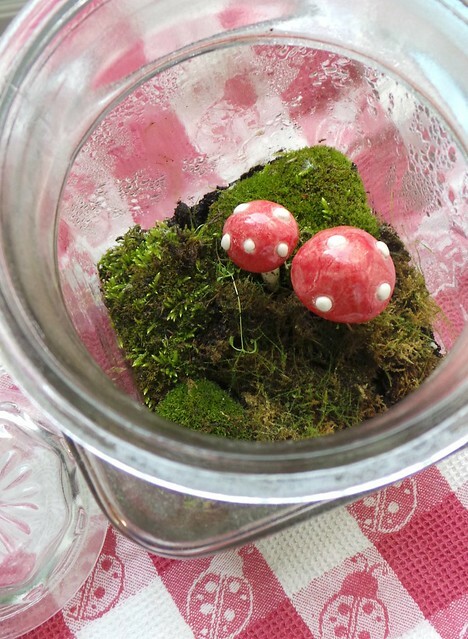 I had red clay toadstools on hand so this is what we used in our terrarium. You can also DIY your own. Check out Pinterest for project ideas! We’ve had a couple of unexpected surprises with our terrarium recently. 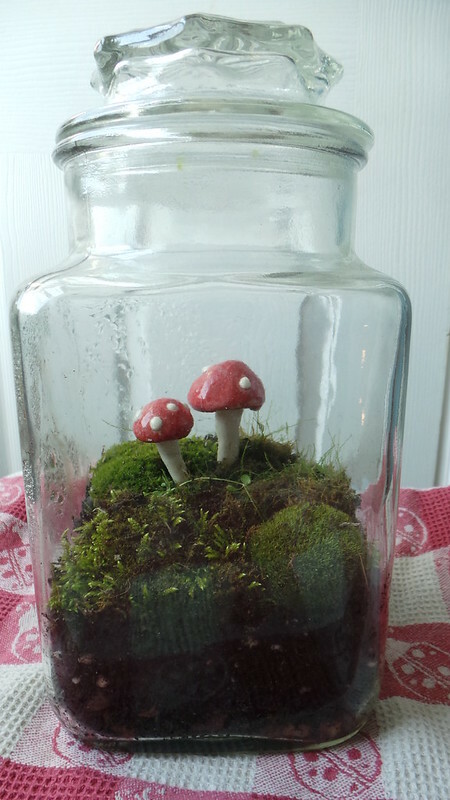 One day we found two mushrooms growing inside! I guess the moss we collected was carrying spores! Sadly, it was a very short-lived surprise as the mushrooms soon withered away but it was cool nonetheless. The mossy terrarium doesn’t need a lot of water. Give it a spritz every once in awhile and you’ll be fine. Have you ever made your own terrarium? If you have a photo, we’d love to see it!